, the foundress of a set of modern fanatics, and the daughter of John Simpson, the keeper of an inn at Fitmy-Can, the half-way house between Banff and Portsoy, in the north of Scotland, was born in 1738; and, when she had completed her one-andtwentieth year, was sent to Glasgow, where she entered into the service of Mr. Martin, one of the principal proprietors of the Delft-work there. In this situation she had remained but a short time, when she accepted proposals of marriage from Robert Buchan, one of the workmen in the service of the same Mr. Martin. 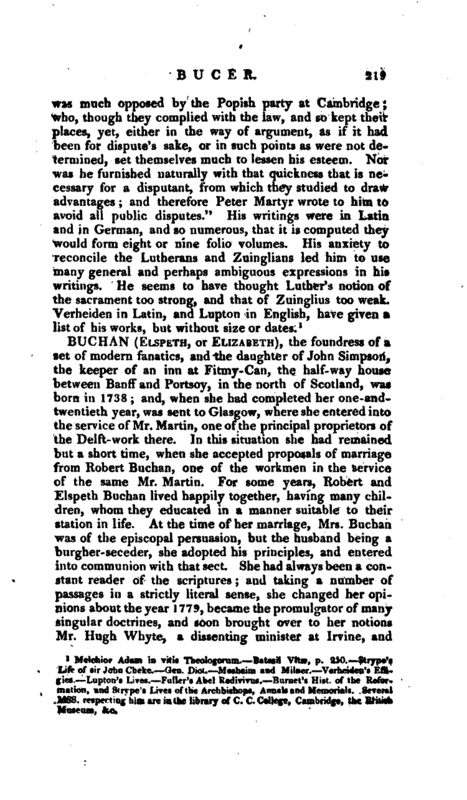 For some years, Robert and Elspeth Buchan lived happily together, having many children, whom they educated in a manner suitable to their station in life. At the time of her marriage, Mrs. Buchan was of the episcopal persuasion, but the husband being a burgher-seceder, she adopted his principles, and entered into communion with that sect. She had always been a constant reader of the scriptures; and taking a number of passages in a strictly literal sense, she changed her opinions about the year 1776, became the promulgator of many singular doctrines, and soon brought over to her notions Mr. Hugh Whyte, a dissenting minister at Irvine, and | connected with Mr. Bell in Glasgow, and Mr. Bain in Edinburgh; and who, upon Mr. Whyte’s abdication of his charge, settled Mr. Robertson in his place at Irvine. She went on continually making new converts till April 1790, at which time the populace in Irvine rose, assembled round Mr. Whyte’s house, and broke all the windows; when Mrs. Buchan and the whole of her converts, of whom the above-mentioned were a part, to the number of fortysix persons, left Irvine. 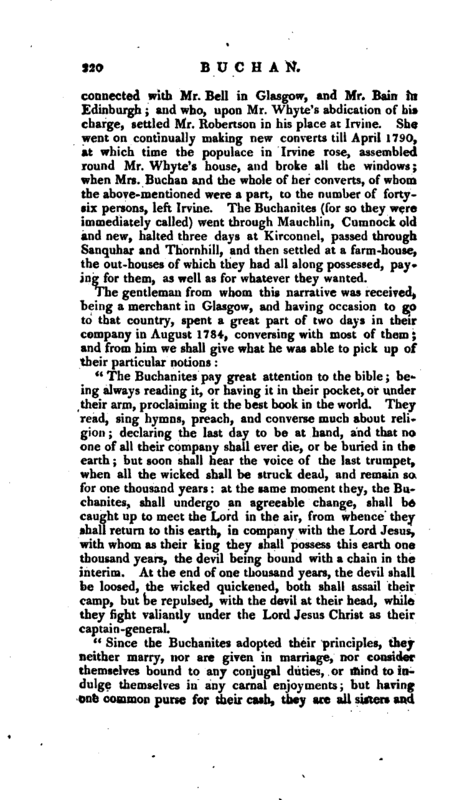 The Buchanites (for so they were immediately called) went through Mauchlin, Cumnock old and new, halted three days at Kirconnel, passed through Sanquhar and Thornhill, and then settled at a farm-house, the out-houses of which they had all along possessed, paying for them, as well as for whatever they wanted. "The Buchanites pay great attention to the bible; being always reading it, or having it in their pocket, or under their arm, proclaiming it the best book in the world. They read, sing hymns, preach, and converse much about religion; declaring the last day to be at hand, and that no one of all their company shall ever die, or be buried in the earth; but soon shall hear the voice of the last trumpet, when all the wicked shall be struck dead, and remain so for one thousand years: at the same moment they, the Buchanites, shall undergo an agreeable change, shall be caught up to meet the Lord in the air, from whence they shall return to this earth, in company with the Lord Jesus, with whom as their king they shall possess this earth one thousand years, the devil being bound with a chain in the interim. At the end of one thousand years, the devil shall be loosed, the wicked quickened, both shall assail their camp, but be repulsed, with the devil at their head, while they fight valiantly under the Lord Jesus Christ as their captain-general. 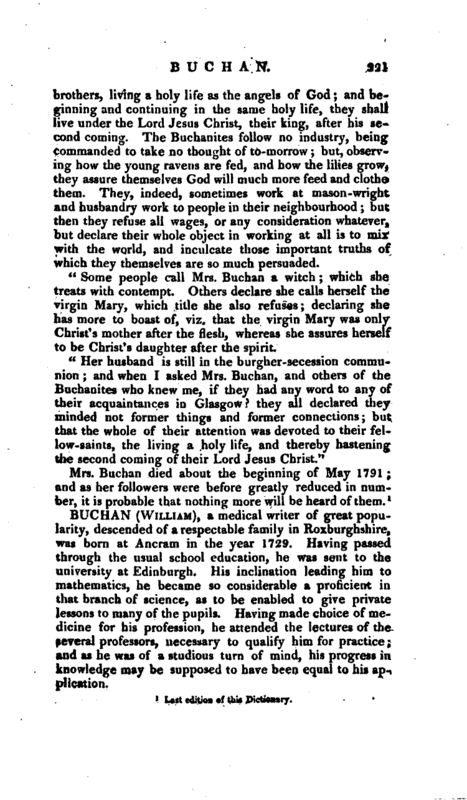 "Since the Buchanites adopted their principles, they neither marry, nor are given in marriage, nor consider themselves bound to any conjugal duties, or mind to indulge themselves in any carnal enjoyments; but having one common purse for their cash, they are all sisters and | brothers, living a holy life as the angels of God; and beginning and continuing in the same holy life, they shall live under the Lord Jesus Christ, their king, after his second coming. The Buchanites follow no industry, being commanded to take no thought of to-morrow; but, observing how the young ravens are fed, and how the lilies grow, they assure themselves God will much more feed and clothe them. They, indeed, sometimes work at mason -wright and husbandry work to people in their neighbourhood; but then they refuse all wages, or any consideration wliatever, but declare their whole object in working at air is to mix with the world, and inculcate those important truths of which they themselves are so much persuaded. "Some people call Mrs. Buchan a witch; which she treats with contempt. Others declare she calls herself the virgin Mary, which title she also refuses; declaring she has more to hoast of, viz. that the virgin Mary was only Christ’s mother after the flesh, whereas she assures herself to be Christ’s daughter after the spirit. Last edition of this Dictionary.